My med school used two mnemonics that helped me when it came time to try to come up with an assessment and plan, VINDICATE and FAMOUS. 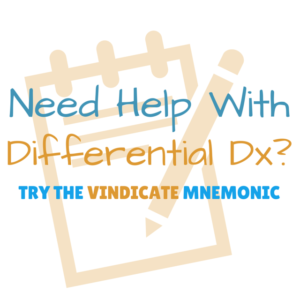 Today I’m writing on how you can use the VINDICATE mnemonic to build a differential that’ll impress your attendings. Why? Because the beginning of third year is all about getting a detailed history and developing your skills at performing full and focused physical exams. However by the end of third year (or if you’re a fourth year who didn’t move beyond the H&P), you need to master the other half of your presentations. It’s vital you master these skills before you start on a sub-I that expects you to perform at this level. How does it work? Think about your patient’s symptoms (the subjective part of your history, pertinent positives and negatives in the ROS) and the objective data you gathered during your physical exam. 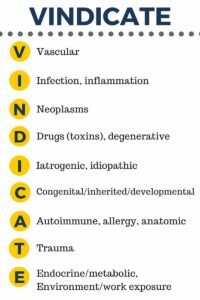 Now, go down the VINDICATE list and think of what could cause the symptoms you’re seeing. For a quick example, you have a 50 year old with complex medical history and multiple co-morbidities who’s short of breath. What’s a vascular cause? Well, you could consider pulmonary hypertension. For infection, what about bronchitis or TB? Neoplasm, is he a smoker? Drugs and toxins, maybe he’s septic, does he meet criteria? Iatrogenic, has he been in the hospital and developed a hospital-acquired pneumonia? In someone this age a congenital issue is unlikely, but perhaps you’ll be surprised to find something in his past medical history if you dig deeper. Does he have allergies that are acting up? Did he fall off a ladder last week and break a rib and his SOB is really due to rib pain? Could he be a diabetic in ketoacidosis or HKA? It also pushes you to use your data gathering skills to mentally decide what’s most common and more likely, versus unlikely. Depending on the situation you may present a brief or long list. However, you should always strive to develop a differential of at least seven possibilities. Why is seven the magic numbers? It’s easy to do two to three, you can stretch your brain to consider four or five. Yet coming up with seven is almost always difficult. I had an ED attending who required me to push for seven for nearly every presentation. His reasoning was that the more often you work at it, the better your differentials will become. But more importantly, you’ll be less likely to miss an important possibility. This is vital when it comes to rotations in the ED, ICU, and pediatrics – but it’s useful in the clinic setting, too. First, a caveat. Do NOT use an app until you’ve run through the mnemonic yourself, and pushed your brain for more than just a few minutes. You need to flex that brain muscle to develop your skills, not immediately leap for your phone. Diagnosaurus is my tried and true app for broadening differentials. It’s only $4.99 for iPhone or Android, can be browsed by symptom, disease or organ symptom and is great for medical students. The only negative is you often need to open the app and check for downloads before you head out to the hospital, especially if you have poor wifi service there. Alternatives I’ve heard of are DDx Teacher and DDx Pocket; the latter is a bit pricey, however I’ve read a great review of DDx Teacher on iMedicalApps, it’s less than $5 and I’m considering giving it a test run. If you’ve tried either app let us know about them in the comments! Medscape’s How Should I Present Cases on Rounds?